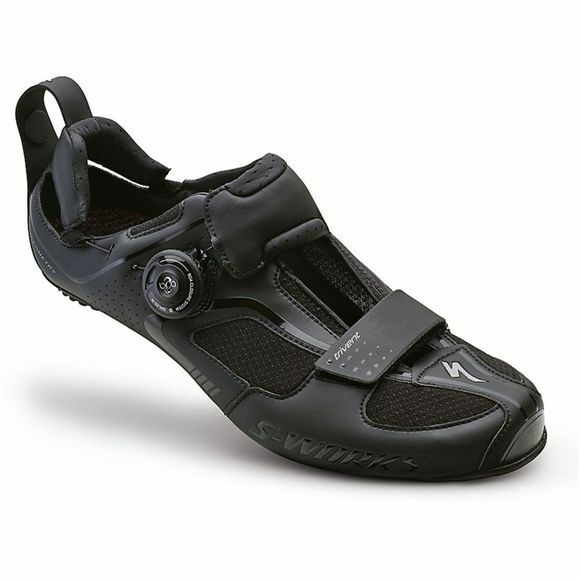 The S Works Trivent cycle show from Specialized is the most highly engineered triathlon shoe in the world designed for elite-level competition in mind. It features the revolutionary Tri-Specific Drawbridge closure system, which leaves the heel of the shoe â€˜poppedâ€™ open and ready for entry in the transition, while the Launch Clip puts the shoe in the level position for the best flying start possible. Couple this with temperature-regulating construction, a stiff and efficient sole, and Body Geometry ergonomics for great fit and performance, and youâ€™re one step closer to your best time ever. FACTâ„¢ 12.0 carbon sole uses high modulus, unidirectional carbon fibre and TorsionBox construction to optimize stiffness and weight. Open tongue design for breathability and drying with toe VelcroÂ® closure.